Thu., June 21, 2018, 11:37 p.m.
Spokane Indians shortstop Tyler Depreta-Johnson was named to the ABCA/Rawlings Division I Gold Glove Team, the American Baseball Coaches Association announced Wednesday. Depreta-Johnson was drafted in the 35th round this season out of Houston Baptist. 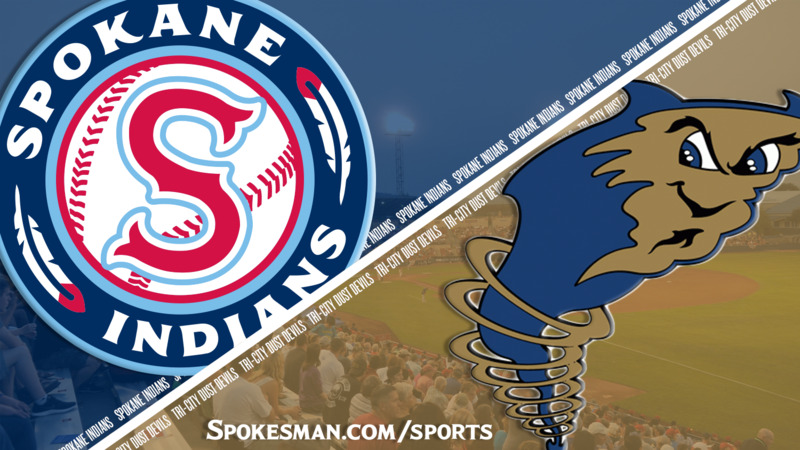 Despite a clutch go-ahead hit by Jonah McReynolds in the top of the 10th inning Thursday, the Tri-City Dust Devils outlasted the Spokane Indians 5-4 in 11 innings on a bases-loaded single by Kelvin Alarcon in Northwest League baseball play in Pasco. Starting pitcher Henry Henry (0-1) of the Dust Devils (4-3) gave up three hits, two walks and struck out four across 4 2/3 innings. Rangers No. 4 pitching prospect Hans Crouse, Spokane’s starter, earned a respectable line in his minor league debut, giving up one hit and one earned run, striking out two and walking three in two innings. Crouse loaded the bases in the first and walked Justin Paulsen to allow the Dust Devils’ first run. Catcher Blake Hunt added to the Dust Devils’ lead in the bottom of the fifth with an RBI single off of right-handed reliever Reggie Meyer. Following a single and fly out, Hunt scored on a wild pitch to push T-C’s lead to 3-0. Meyer recovered from the rough inning by setting down eight consecutive batters, striking out three in 2 2/3 innings. The Indians (2-5) entered the game with the third-worst batting average in the league (.224), but they found their swing in the top of the sixth with four singles and two walks to tie the game at 3. Spokane missed a chance to take the lead with runners on second and third with no outs in the top of the seventh. A groundout and two strikeouts left the potential go-ahead run stranded. The Indians went 4 for 18 with runners in scoring position and left 10 runners on base. Indians left-handed reliever Sergio Suarez struck out three and walked one to two innings to preserve the tie heading into extra innings. Spokane began the its 10th with shortstop Diosbel Arias on second base because of a new rule in minor league baseball to shorten games. McReynolds drive in Arias to give Spokane a 4-3 lead. Tri-City started the bottom of the 10th with Aldemar Burgos on second. He came around to score the tying run after an error by third basemen Tyler Depreta-Johnson. The Indians ran out of pitchers in the 11th, so infielder Juan Ventura took the mound and walked the bases loaded with no outs. Alarcon delivered the winner to right field. T-C right-hander Steven Wilson (1-0) gave up one hit and an unearned run while striking out three in two innings. Published: June 21, 2018, 11:37 p.m.